Happy Sunday! I'm trying to keep a happy face even though my vacation is now officially OVER. 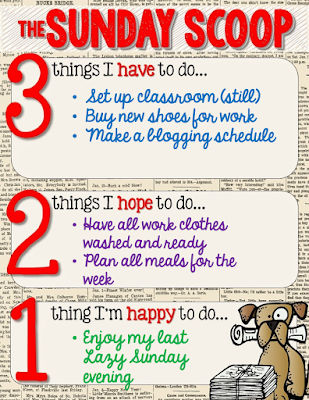 Linking up with The Teaching Trio for The Sunday Scoop...read all about it! I truly am rested and ready to go back to work, but...another week would have been nice. Well, I really hoped to have my classroom ready before the official start of planning week, but a lack of AC (in South Florida in August,,,no thank you!) and a new roof being placed on my class kind of threw a wrench into that plan, and I completed about 12% of what I wanted done. It's OK, I don't mind sleeping at work this week! I also need to get some new shoes for the new school year. I'm treating myself to something nice. I always cheap out on work shoes and end up destroying my feet. Finally, it's important that I make myself a blogging schedule to stick to with all the craziness ahead. I enjoy blogging and I have goals for this little venture of mine, and I don't want to put it on the back burner. In the interest of being totally organized and on top of things this year, I want all my work clothes (we wear uniforms so this is easy...and the only good thing about a uniform) ready to go and all my meals planned ahead of time. The main reason I get stressed is being overwhelmed, and I can control that by a little bit of planning ahead. Tonight it is all about me, my couch, my dogs, and that guy I live with. With our work schedules, we don't really see each other during the week when I'm at school, so I try to appreciate all the small moments as much as possible. Don't forget to link up at The Teaching Trio and share your own Sunday Scoop! 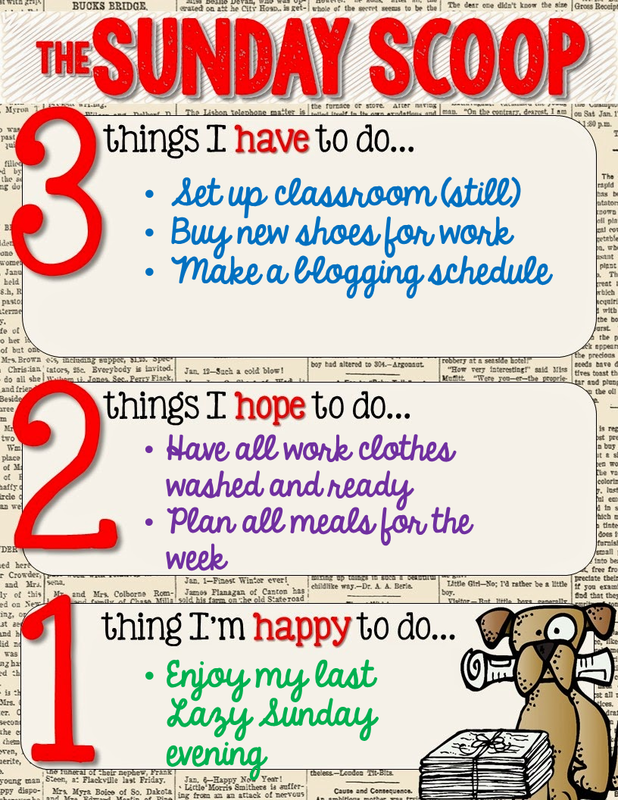 I love the idea of making a blogging schedule! Obviously if you look at the amount of posts I've made since, I'm not doing a great job at this, lol, but there are a lot of great calendars on TpT that can help you set up a schedule. I don't know how people fit everything in!